Fury Fighting Championship returns to the Humble Civic Center on July 20 for Fury FC 25. The stacked card will be headlined with Rey Trujillo defending his Fury FC featherweight title against an undefeated contender, Jake Heffernan. 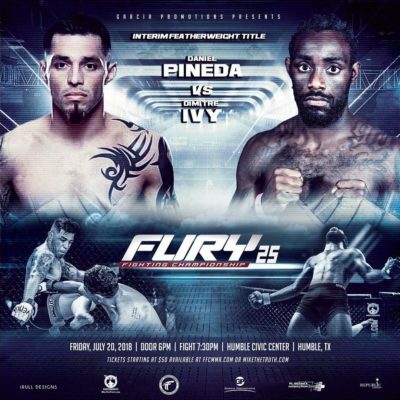 In the co-main event, Dimitre Ivy will take on former Legacy FC 145 & 155 champion and UFC veteran, Daniel Pineda. Check out the fight card below. You can purchase your Fury FC 25 tickets here at MikeTheTruth.com. Be sure to select favorite fighter.